This is extremely important if you plan to attend a football game in the Great Plains this afternoon or evening. 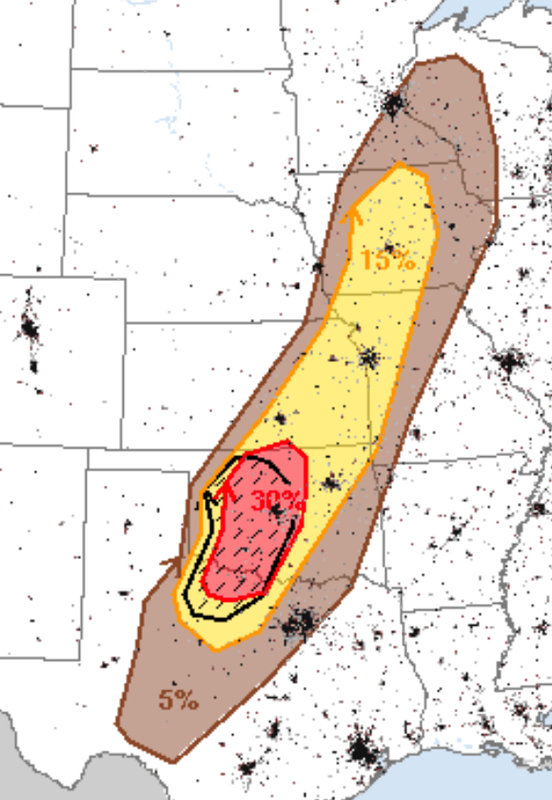 The significant risk is the brown area. It does not mean a tornado will occur but, to give you some perspective, it is a great enough risk that a tornado watch will likely be issued this afternoon. Of course, a tornado warning will be issued if it is time to take cover. The significant risk of 1" or larger hail is the yellow area. The red is an enhanced risk of 1" hail. The hatched area is where hail larger than 2" is forecast to fall. It is important that you have a plan. If your AccuWeather App tells you a warning has been issued or if the stadium authorities give instructions, follow them. If the stadium announcer does not give you instructions after receiving a warning for severe thunderstorms or tornadoes, you are probably better off in your car than you are in your seat. This is especially true if lightning is a threat, which it will be in the brown, yellow and red areas.